ABB Group members cooperated with Alan Paul in putting together what could prove to be one of the more comprehensive behid-the-scenes books ever written about a band. 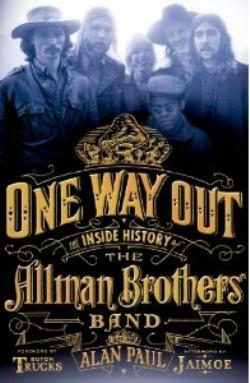 One Way Out - The Inside History of the Allman Brothers Band will be published on February 18 and promises to get into the sordid history of America's legendary Southern Rock band through very candid interviews with more than 60 people, including every surviving member of the group. The book will also include previously unpublished photos, personal correspondence, memorabilia and introductory and closing portions written by Butch Trucks and Jaimoe from the band.